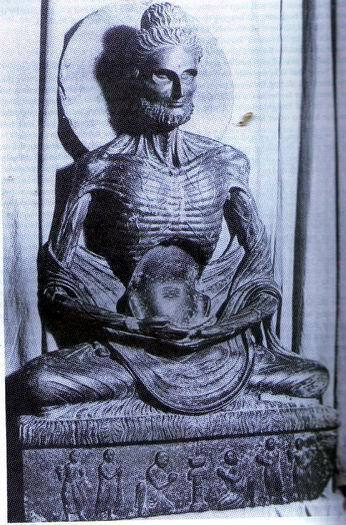 One of the most well-known images of the Buddha is this one from the Sikri Stupa, now in the Lahore Museum, which depicts him seated in meditation but almost skeletal, his body reduced to a frame of bones over which the skin is tautly stretched and the veins and sinews lie like a web. 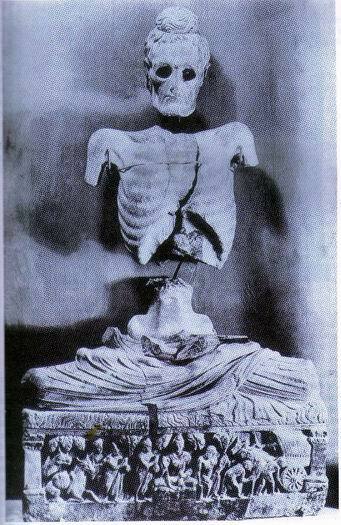 Yet, while a famous image today, it is one of but a handful of such images of the emaciated Buddha. In fact, from the South Asian subcontinent such images occur almost entirely from one small geographical area and from one short time period, that is from the Gandharan area of what is primarily modern Pakistan with dates to the first four centuries C.E. there are examples that occur in Southeast Asian art at a much later time, one type of which, that from Pagan in Burma of the twelve-thirteenth centuries, I will bring up in this discussion, but my focus is on the Indian examples. My question is why the emaciated Buddha images are not found else where in Indian art, and if their lack of popularity has to do with notions of health and of the body? Then I thought, what if I were to take food only in small amounts, as much as my hollowed palm would hold, juice of beans, vetches, chickpeas, or pulse. (He does so.) My body became extremely lean. Like asitkapabba or kalapabba plants became all my limbs through the little food. The mark of my seat was like a camel's footprint through the little food. The bones of my spine when bent and straightened were like a row of spindles through the little food. As the beams of an old shed stick out, so did my ribs stick out through the little food. And as in a deep well the deep low-lying sparkling of the waters is seen, so in my eye-sockets was seen the deep low-lying sparkling of my eyes through the little food. This is only part of a longer description, one, which indeed appears to fit well the Sikri image. But such austerities did not bring Sakyamuni to Enlightenment, and feeling that "it is not easy to gain that happy state while my body is so very lean," he decides to take (solid) food again. The next event in the narrative is the actual Enlightenment sequence, when Sakyamuni sits under the Bodhi Tree and reaches Enlightenment. Taking food is a clear rejection by the Buddha of extreme austerities and bodily mortification, which in the context of the times at which these events took place (or the texts were composed) can be seen as a repudiation by the Buddha (and Buddhists) of such 3extreme practices by rival sramana sects, such as the Jains and the Ajivikas. The texts make clear that the Buddha has practiced such austerities to greater and more masterful extremes than any of the ascetics, and his rejection of these practices thus comes from one who has the moral authority of an insider who has mastered them. But, while all scholars I have thus far consulted interpret the images as Sakyamuni during the six-years of fasting, I disagree with them. Let us look again at the textual narratives. While these vary considerably as to the particulars of the events and their exact chronology, there is in all of them a second period of fasting that takes place, this almost immediately after the first, and this at Bodhgaya. The first period of fasting, that of the six-year struggle, ends when Sakyamuni decides to take food, again a textually varied story but it entails food being given to Sakyamuni by a female house holder who mistakes him for a tree divinity. The second period of fasting immediately follows Sakyamuini's taking food from the female householder, and lasts forty-nine days, from when he begins his twenty four hour vigil under the Bodhi Tree, reaches Enligtenment, and ten spends seven weeks at Bodhgaya, each week in a different activity and location. Again, the Buddha being given food, in this case by two merchants breaks this period of fasting, Tapussa and Bhallika, who became by this act the first lay devotees of the buddha. The sangha not yet being formed, they took refuge in only the Buddha and his Doctrine. Thus, there are two periods of fasting which both ends by food being given to the Buddha. Most, if not all, of the Gandharan images represent, I think, the Buddha during the forty-nine days of fasting at Bodhgaya. The textual biographies of the Buddha vary considerably in most details of his life, and which presently extant texts may best reflect those known in Gandhara during the first centuries CE is difficult to know. In any event, textual sources for artistic representations of life scenes have been shown to be an extremely complicated issue, one tat suggests that plastic imagery did not follow in any exact or literal fashion the word texts. The two, word texts and plastic representations, were two parallels and interacting traditions, and it was not the case that images followed texts. Nevertheless, I want here to relate the fasting sequences using one text, the Nidanakatha, in order to give a more concrete sense of the na4rative before turning to the visual evidence. In the Nidanakatha, which is appended to the Jatakas as an introduction, Dakyamuni gives up the six years of fasting which had caused his body to become thin, dark in color, and without the thirty-tow marks of a great man by "begging through the villages and towns." The food changed Sakyamuni's appearance as "the thirty-two signs of a great man appeared again upon him, and his body became fair in color, like unto gold." The five fellow ascetics who have been doing penance with him at this point leave in disgust and go to Sarnath (Isipatana). Next is the scene when the female householder, here named Sujata who lives in the village Senani at Uruvela, presents Sakyamuni food as he sat under the Nigrodha tree to which she had made a vow to make an offering each year if she were to marry at her won rank and have a son as a first child. Her wish fulfilled, she brings early one morning a rich rice-milk, which she pours into a golden bowl and gives to Sakyamuni, assuming he is the god who has descended from the tree. Sakyamuni knew that this day he would reach Enlightenment, and had been waiting under the tree before beginning his begging rounds. Then, with the golden bowl of rice-milk, he first takes a bath in the Neranjara River, then sits facing east and divides Sujata's gift into forty-nine little balls of rice all of which he eats. The text says, "Now that was the only food he had for forty-nine days, during the seven times seven days he spent, after he became a Buddha, at the foot of the Tree of Enlightenment. During all that time he had no other food. The Budhisat [that is, Sakyamuni] turning his back upon the trunk of the Bo-tree, and with his face toward the East, made the firm resolve: 'May skin, indeed, and sinews, and bones wilt away, may flesh and blood in my body dry up, but till I attain to complete enlightenment this seat I will not leave!' And he sat himself down in a cross-legged position, firm and immovable, as if welded with a hundred thunderbolts. We can skip far ahead now, after Enlightenment had been gained and to the seven times seven period he spent at Bodhgaya following Enlightenment, to when during "the last day of the seven weeks-the forty-ninth day-he felt a desire to bathe his face. And Sakka, the devagovernor, brought a fruit of the myrobolan-tree, and gave him to eat. And Sakka, too, provided a tooth-cleanser...and water to bathe his face." This is the first food he has after the second period of fasting, and it is immediately followed by the gift of rice and a honey cake by the two merchants, Tapassu and Bhallika. Let us now return to the Sikri image. There are few clues to help us identify the point in the fasting sequence that this famous image is intended to represent. We may note that it is the Buddha being depicted, that is, that the hair, placed as a bun on top of the head, and the upper robe which once covered both shoulders but has now slipped off the frail frame, are the same as those on the post-Enlightenment Buddha images. The beard, not found on Buddha images of other life scenes, indicates his long period of not tending to his personal care, but could occur equally in either of the two periods of fasting. The scene on the predella of six monks worshipping a fire altar appears of little relationship to the emaciated image and, with similar scenes occurring on a variety of images in Gandharan art is not helpful to any identification. Perhaps the only clear clue is the indication on the seat of the grass, its beautiful rhythmic pattern being the form which was within the power of a truly able sculptor and which must have been similar to what inspired the line from the Nidanakatha quoted above. A fragment of a relief showing several scenes also in Lahore may support the association between the seat and the emaciated Buddha. The lower scene shows the Buddha approaching the seat with the grass while the middle scene shows the Buddha, now emaciated, on the seat. The broken third scene shows a full bodied seated Buddha, unfortunately so destroyed that we cannot identify the scene, but the only sequence that makes sense is that the Buddha prepares the seat, is shown emaciated during the forty-nine days of fasting, and then is shown restored to his perfect body. Perhaps the second most impressive emaciated Buddha image from Gandhara is that from Takht- i -Buhai now in Peshawar. Although badly damaged, it would have been almost exactly the same size as that from Sikri (both about 33 in. high) and is very similar in many ways. The scene on the predella, however, is very different, and supplies an almost sure connection of the emaciated image with the second period of fasting at Bodhgaya. This scene is that of the two merchants, Tapussa and Bhallika, offering food to the Buddha at the end of the forty-nine days. The merchants are approaching the Buddha on his right holding offerings in bags or clothes. The figure behind them is identified by Ingholt as the deva who alerted the merchants to the Buddha's presence, with Vajrapani seated on Buddha's left, and the bullock cart whose wheels became bogged down keeping the merchants from advancing on Vajrapani's left. The Buddha whom the merchants approach is not emaciated, but holds his hand in abhayamudra, gesturing for the merchants to approach him without fear. The connection of the food to the restored body of the Buddha is thus made in the predella scene. There is one emaciated image that appears to show the Buddha during the period of the six-year fasting. This image, now in the British Museum, has been identified as showing Sujata offering food to the Buddha, identification first made by A. Foucher and then followed by all subsequent scholars. I do not agree with Foucher, and I will say why, but even if he is correct in this particular identification I still maintain that the period of fasting was not a clearly defined period that Foucher is perhaps most responsible for setting up and, as I have said, has been followed by every scholar since. The British Museum relief depicts the emaciated Buddha flanked by four figures. Sujata is identified by Foucher as the female figure on the Buddha's right because the is making him an offering. Vajrapani is at Buddha's right shoulder, and the two male figures on the other side Foucher identifies as Indra (with the large head dress) and Brahma, their presence being due to their role of infusing the Buddha or his food with divine sustenance. I noted that in the Nidanakatha Sakka (that is, Indra) gave the Buddha a myrobolan fruit after the forty-nine days fast at Bodhgaya, just before the gift of the cakes by the tow merchants. Actually, the gods are also involved, although I did not mention it, in the Nidanakatha with the food given to the Buddha after the six-year fast. Brahma, Indra, the four guardians, and a host of other devas are present while Sujata prepares the rice-milk. By their divine power the devas gathering so much of the sap of maintenance as would suffice for the support of all men and devas of the four continents, and their circumjacent two thousand isles as easily as a man crushing the honey-comb formed round a stick would take the honey-they infused it infused it into to milk-rice. At other times devas infused the sap into each mouthful of rice as he took it; but on the day of his Buddhahood, and on the day of his passing away, they infused it into the very vessel-full of rice itself. Foucher is relying on another text for his identification of Sujata in the British Museum relief, the Lalitavistara, which actually works less well for his identification than does the Nidanakatha as the gods Indra and Brahama are not specifically mentioned in the Lalitavistara as playing a role in Sujata's gift of food. Rather, in the Lalitavistara gods appear during the six-years fast with the offer to infuse sustenance through the Buddha's pores, which the Buddha rejects as a "lie." Other texts relate yet other roles for the gods during the six-year and forty-nine day fasts, but for us that the gods are involved in the fasting sequences is the important point. It is that food or bodily sustenance are offered by both gods and humans, as both classes of beings are supporters of the Buddha who participate in bringing him back to health by the essential act of a devotee, the giving of food. If we return to the British Museum relief, my suggestion is tat the female figure is not that of Sujata, but of a female devotee. Her hand gesture is that used repeatedly by devotees, indeed is used by the male figure opposite her, who may be a male devotee (her hasband?) or Brahma. And we have other relief showing devotees surrounding the emaciated Buddha in a similar arrangement but without a female figure present. Nevertheless, as I said, even if the figure is Sujata, the identification of other emaciated Buddhas as indicating the forty-nine day fast at Bodhhaya is not affected. When the Buddha received food after the six-year fast his body was restored, as we saw in the Nidanakatha, to the beauty it had before, in art, while the style varies with place and period, images of the Buddha consistently have a beautiful body, one that is represented similarly in all scenes from his life. Even when he grows old and the texts speak of him as aged, he is never shown as such in the art. The perfect and beautiful body of the Buddha indicates his stature as a mahapursa, but also his inner moral superiority. Recall that by merely seeing the Buddha characters in tests are able to identify him as of unusual spiritual accomplishment and moral worthiness. The black and emaciated body of the Buddha indicates just the opposite, indeed, it indicates death, in opposition to what the Buddha most particularly accomplished, victory over death. Looking again at the textual narratives, we find that the six-year fasting almost brought the Buddha to death, and in some versions the Buddha himself wonders if he should stop eating altogether and die. In the Padhana-sutta, Mara appears during the austerities to urge the Buddha back from death by saying "lean art thou and ill-favored, near to thee is death. Death hath a thousand parts, only one part of thee is life. Live, good sir; life is better. Living thou shalt do good works." Many texts, including the Nidanakatha, say that at one point the Buddha is considered dead by the gods when he falls and loss consciousness. He, however, comes back to consciousness, perhaps as close as we come in Buddhism to a resurrection. Furthermore, the wasted and black body of the emaciated Buddha indicates not only death, but pain as well, for the austerities were filled with pain as is mentioned in the textual accounts. An image of pain and death, of the very characteristic and result of life that the Buddha said he could overcome, would appear, regardless of the life event it might indicate, of little appeal to the Buddhists. One possible reason, thus, for not wanting to represent the emaciated Buddha and for its almost total absence in south Asian art is because it represents the Buddha doing something that he in fact rejected and advised against, and more broadly it represents the Buddha embodying the very concepts of pain and death which he had overcome. Nevertheless, the texts have no problems with describing, and doing so in great detail, these it images, events, a concept. Furthermore, among the Gandharan images are examples, such as the British Museum relief, which show worshippers honoring the emaciated Buddha. Certainly the Sikri and Takht-i-bahi images are major icons, and from the little archaeological evidence that indicates where such images were placed in their architectural settings, we know that they were not hidden away. more plausible answer for the limited examples of the emaciated Buddha may derive from their identification as the Buddha during the forty-nine days fast at Budhgaya. The period the Buddha spent at Bodhgaya involved, as we have seen, a number of activities, which begin with his sitting under the Bodhi Tree. The texts very greatly on what these events were and how long the Buddha remained at Bodhgaya following his Enlightenment. Even the events during the first night that led to the Enlightenment vary. In art, the period at Bodhgaya is depicted in a variety of ways as well, often with events being conflated into a single scene. Some events, particularly those of the seven weeks after Enligtenment, are very rarely depicted, and they hardly appear at all in Gandharan art. Thus, the entire Bodhgaya cycle is open to a wide range of artistic depictions that vary with place and time. I have given some evidence based on the images themselves that suggests the Gandharan images are part of the Bodhgaya cycle. I will be able to show now that the emaciated Buddha was cle3arly associated with the site of bBdhgaya from at least the seventh century CE. When the Chinese pilgrim Hsuan-tsang visited Bodhgaya in the seventh century he left us a vivid description of the temple and its sacred area. Included were the seven stations, each a separate shrine, as well as many other places marking events, usually with Supas. To the east of the tank of the Naga Mucalinda he says. In a vihara standing in a wood is a figure of Buddha, which represents him as thin and withered away... . This is the place where Bodhisattva endured his penance. Here it was Tathangata subdued the heretics and received the request of Mara, and then entered on his six-year's fast, eating a grain of millet and of wheat each day; his body then became thin and withered and his face marred. Hsuan-tsang's reference first tells us that, while no examples remain of the emaciated Buddha from India, there was one at Bodhgaya in the seventh century. And second, Hsuan-tsang's reference identifies the image as that representing the six-year fasting. He says it was located where Mara requested something of the Buddha, perhaps a reference to the event given in the quotation I noted above from the Padhana-sutta? The reference to the heretics is to the conversion of Uruvela Kassapa and some thousand other Hindu ascetics, an event that happened long after Enlightenment when, after the Buddha had given his First Sermon and spent the first rainy season at Sarnath, he went to Uruvela and performed the conversion. It is the place name "Uruvela," recall the place from which Sujata came that apparently allows Hsuan-tsang to make all his associations. What is confusing in Hsuan-tsang's identification is that Urauvela (was there more than one place named this?) and the place of the six-years fast is varied and contradictory in the texts and in the historical record. Fa-hsien, for example, who was in India in the fifth entry, says the place Sakyamuni spent the six-years fast is twenty li (about 6 miles) from Bodhgaya, which was itself abandoned on Fa-hsien's visit. Fa-hsien does not mention Uruvela. Hsuan-tsang's placement of the emaciated Buddha's shrine near the temple at Bodhgaya appears to me to suggest that it was not originally meant to be that of the six-year fast. In any event, at least we know that an image of the emaciated Buddha was located at Bodhgaya. The association with Bodhgaya can be seen as well with evidence from Burma. Much has been written about the twelfth-thirteenth century small stone plaques, found mostly in Pagan, that represents the eight major life scenes and, sometimes the seven stations at Bodhgaya. As far as I know, I was the first scholar to identify why there were only seemingly six stations shown (the seventh being indicated by the same central earth touching figure that simultaneously indicated the life scene,) but that there were at times the emaciated Buddha added, as here, was still a mystery to me. Now I recognize that the emaciated image was another station at Bodhgaya, one that indicated, I think, the forty-nine day fast. This localization of the emaciated Buddha to the Dodhgaya cycle might help to explain the limited extent of the imagery in India. The stations at Bodhgaya were, as I have said, only rearely depicted in Indian art. Images of the Buddha under the Naga Mucalinda, for example, are confined almost exclusively in Andhran art of the second-third centuries CE. Most of the stations, in fact, are not depicted at all. The entire cycle at Bodhgaya was, for most of India, apparently captured in the powerful image of the earth touching Buddha under the Bodhi Tree. I do not know why Gandharan artists were drawn to the emaciated Buddha, but it may relate to their interest, shared with Greco-Roman artists, in artistic naturalism. Returning now to Hsuan-tsang's account, there is an astounding observation he makes that I left out of my quotation above, which has to do with how the emaciated Buddha image was used at Bodhgaya. He says "Both in old times and now, among the better classes and the poor, those who suffer from disease are accustomed to anoint the figure with scented earth, on which they get cured in many cases." The image of the emaciated Buddha was thus associated with disease and health, and could cure those who worshipped it. The placing of scented earth on the image, I would guess, had to do with placing the earth on the area of the body of the Buddha that corresponded to that which was diseased in the worshipper. I can also only speculate why the image came to be related to curing disease, but could it be because of its relationship to death and pain discussed above? The Buddha approached death, suffered great pain, and came back to life and health. 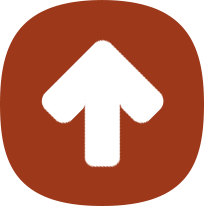 This "resurrection" was what was of interest to those who were suffering and ill. This function of the Buddha image has nothing to do with a specific narrative, but with the knowledge that his " sick" body healed itself. It is a case in which the textual narrative cannot explain the ritual use of the image. The image was important, but not because it told a story.